Introduction: Hypermethylation of genes associated with promoter CpG islands, and hypomethylation of CpG poor genes, repeat sequences, transposable elements and intergenic genome sections occur during aging in mammals. Methylation levels of certain CpG sites display strict correlation to age and could be used as “epigenetic clock” to predict biological age. Multi-substrate deacetylases SIRT1 and SIRT6 affect aging via locus-specific modulations of chromatin structure and activity of multiple regulatory proteins involved in aging. Random errors in DNA methylation and other epigenetic marks during aging increase the transcriptional noise, and thus lead to enhanced phenotypic variation between cells of the same tissue. Such variation could cause progressive organ dysfunction observed in aged individuals. Multiple experimental data show that induction of NF-κB regulated gene sets occurs in various tissues of aged mammals. Upregulation of multiple miRNAs occurs at mid age leading to downregulation of enzymes and regulatory proteins involved in basic cellular functions, such as DNA repair, oxidative phosphorylation, intermediate metabolism, and others. Conclusion: Strong evidence shows that all epigenetic systems contribute to the lifespan control in various organisms. 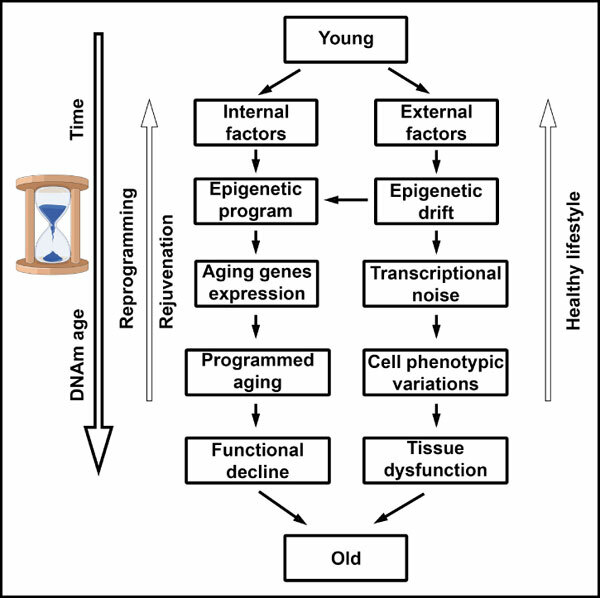 Similar to other cell systems, epigenome is prone to gradual degradation due to the genome damage, stressful agents, and other aging factors. But unlike mutations and other kinds of the genome damage, age-related epigenetic changes could be fully or partially reversed to a “young” state. Epigenetics, Aging, DNA methylation, Histone modification, miRNA, Epigenetic age, Epigenetic reprogramming.